Climate analyst Paul Homewood: "Sometimes a story comes along which underlines just how corrupt climate science has become...Anybody with any expertise on tornadoes knows that there has been an increase in tornado reports over recent years simply because of better reporting...To include the weakest EF-0 tornadoes in the study fundamentally undermines the whole exercise, given that EF-0s now account for over 60% of all tornadoes...So, what happens when we only look at the stronger EF3+ tornadoes in Alabama? Surprise, surprise, they have become much less frequent!" "The spike in 2011 obviously sticks out a mile, just as 1974 and 1975 do, but they are outliers, and should not be confused with underlying trends. 2011 was a weather event, just as 1974 and 1975 were, and nothing to do with “climate”...Question – Gensini begins his study in 1979. Why? By doing so, he takes the early 1970s, when tornadoes were much more common, out of the equation...In any event, the supposition that tornadoes did not use to be common in the southeast is bunkum. Mississippi and Alabama have actually had the most tornadoes on an area basis since 1995 of all states with the exception of Kansas." 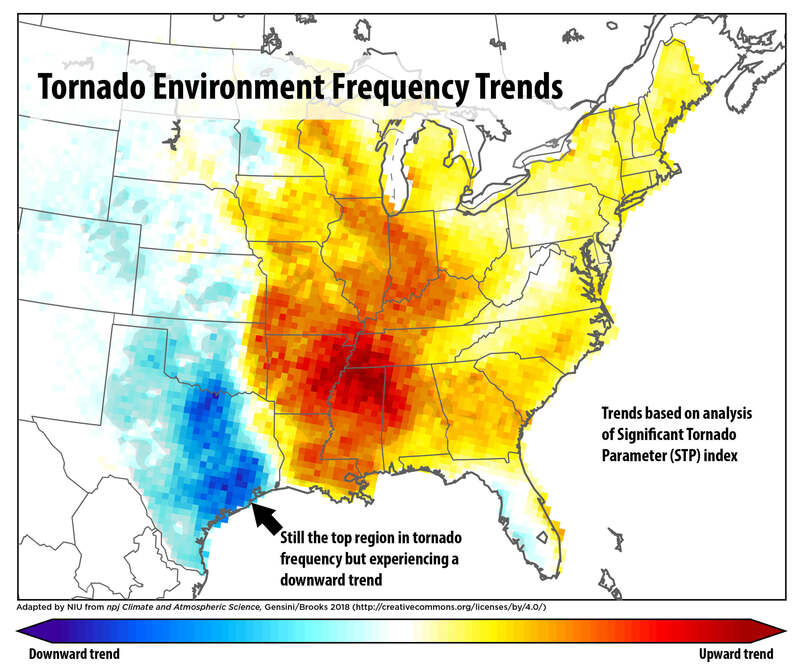 "There is no evidence whatsoever that “tornado activity has increased” in the southeast, as claimed...Unfortunately, as long as money is thrown at junk studies like this one, they will keep being written. But one is entitled to ask why peer review never picked up such obvious flaws in the paper." Sometimes a story comes along which underlines just how corrupt climate science has become. At least 23 people have died after a tornado barrelled through Lee County, Alabama on Sunday, leaving behind damage that Sheriff Jay Jones described as “catastrophic,” CBS reported. “I cannot recall, at least in the last 50 years, and longer than that, a situation where we have had this type, this loss of life that we experienced today,” Jones told CBS affiliate WRBL-TV. The National Weather Service (NWS) in Birmingham, Alabama issued a tornado emergency at 2:09 p.m. Sunday for Lee County, AccuWeather reported. The tornado was part of an extreme weather event Sunday that saw several tornadoes touch down across the Southeast as part of a series of storms, The Associated Press reported. The incident comes a little less than six months after a Northern Illinois University study found that tornado frequency was trending away from the traditional “tornado alley” of the Great Plains towards the more densely populated Midwest and Southeast. This is bad news for the South, where tornadoes are more deadly because of higher population density, a high number of vulnerable mobile homes and a greater chance of tornadoes occurring at night. 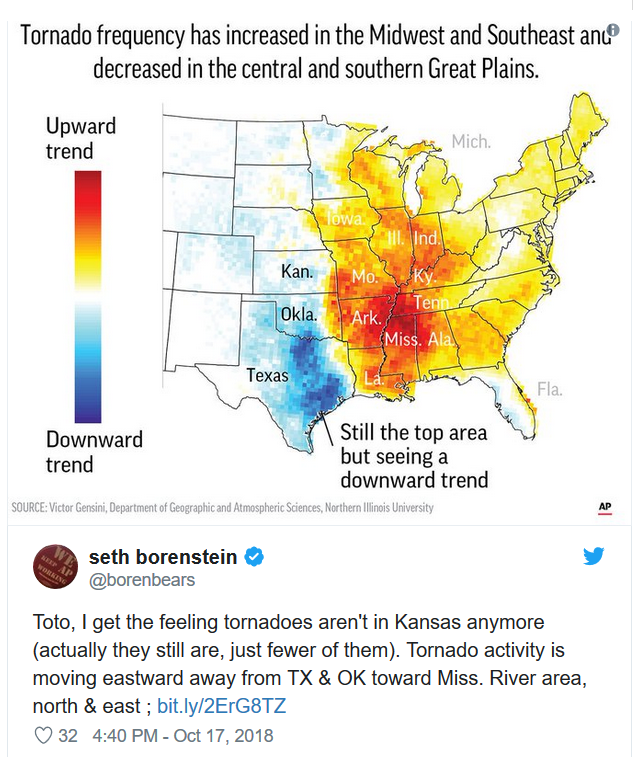 Researchers told CBS at the time that the eastward shift of tornadoes was related to the eastward push of dry air from the desert into the plains, shifting the “Dry Line” between dry desert air and warm, wet Gulf of Mexico air along which most tornadoes occur. Study author Dr. Victor Gensini of Northern Illinois University told CBS this shift could be due to climate change. “It’s not a big jump to say that climate change is causing this shift east. The hypothesis and computer simulations support what we are observing and what we expect in the future,” Gensini told CBS. A new study finds that over the past four decades, tornado frequency has increased over a large swath of the Midwest and Southeast and decreased in portions of the central and southern Great Plains, a region traditionally associated with Tornado Alley. The Gensini study, which is here, makes absolutely clear that “all tornadoes” were used in the analysis, which runs from 1979 to 2017. 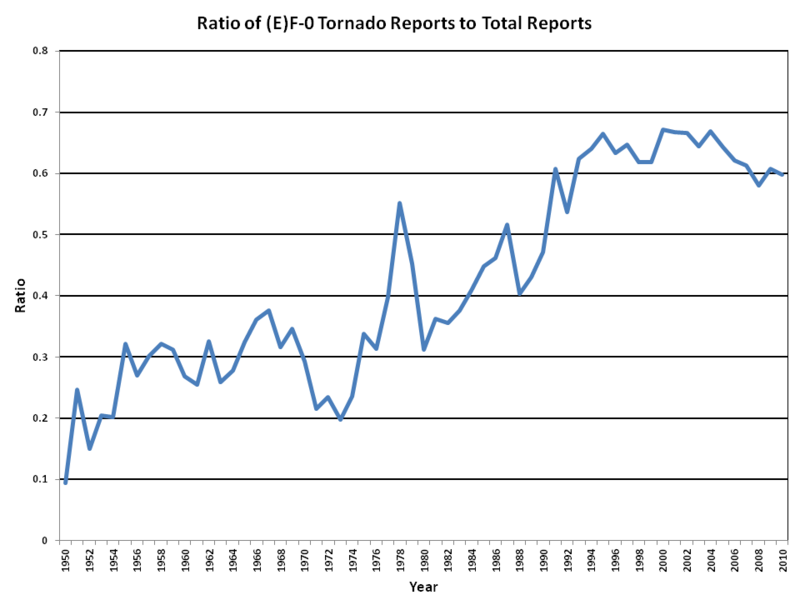 Yet anybody with any expertise on tornadoes knows that there has been an increase in tornado reports over recent years simply because of better reporting. 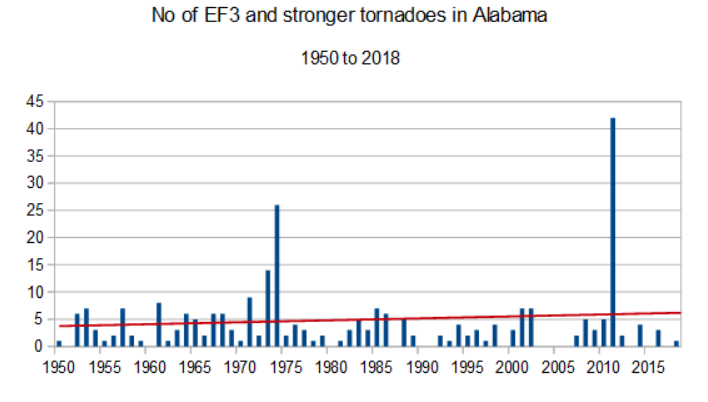 To include the weakest EF-0 tornadoes in the study fundamentally undermines the whole exercise, given that EF-0s now account for over 60% of all tornadoes. 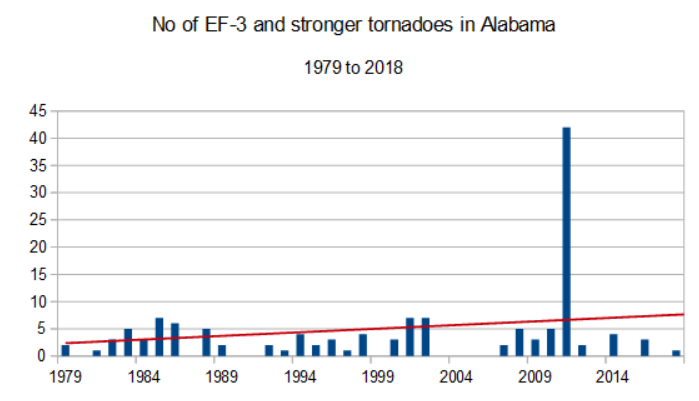 So, what happens when we only look at the stronger EF3+ tornadoes in Alabama? Surprise, surprise, they have become much less frequent! The spike in 2011 obviously sticks out a mile, just as 1974 and 1975 do, but they are outliers, and should not be confused with underlying trends. 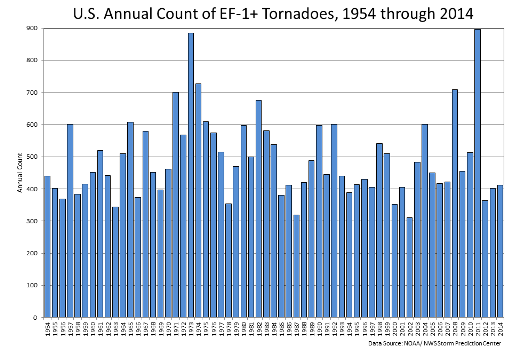 2011 was a weather event, just as 1974 and 1975 were, and nothing to do with “climate”. By starting in 1979, instead of 1950 or 1970, Gensini turns a declining trend into an increasing one. 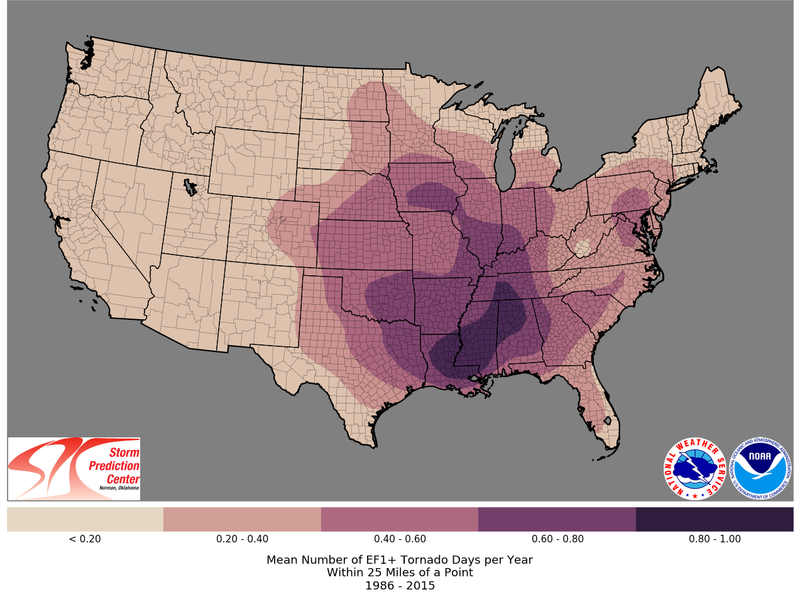 In any event, the supposition that tornadoes did not use to be common in the southeast is bunkum. 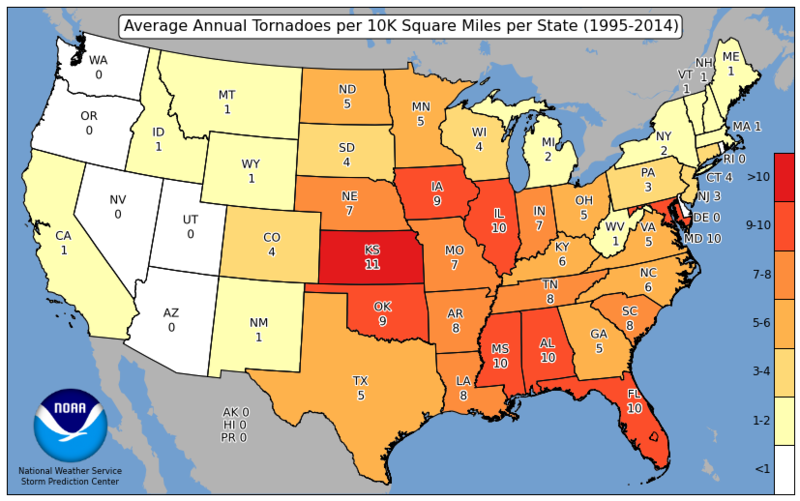 Mississippi and Alabama have actually had the most tornadoes on an area basis since 1995 of all states with the exception of Kansas. Using 1986 to 2015 climatology, the belt with most intense activity lies across Alabama, Mississippi and Louisiana. 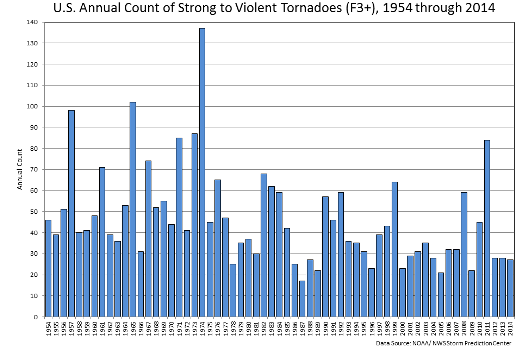 There is no evidence whatsoever that “tornado activity has increased” in the southeast, as claimed. Unfortunately, as long as money is thrown at junk studies like this one, they will keep being written. But one is entitled to ask why peer review never picked up such obvious flaws in the paper.